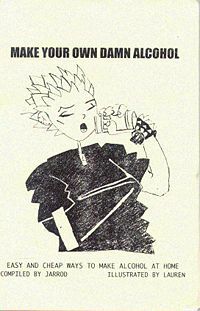 Make Your Own Damn Alcohol - ZineWiki - the history and culture of zines, independent media and the small press. Make Your Own Damn Alcohol is an educational zine about "easy and cheap ways to make alcohol at home." Written by Jarrod Blatz of Systemsuck Records and illustrated by a person named Lauren, the zine includes recipes for different types of beer, ciders, mead, and more. The recipes require only the use of common household ingredients. This page was last modified on 6 January 2013, at 13:52.